More than just a short course in trees on farms for farmers . . . 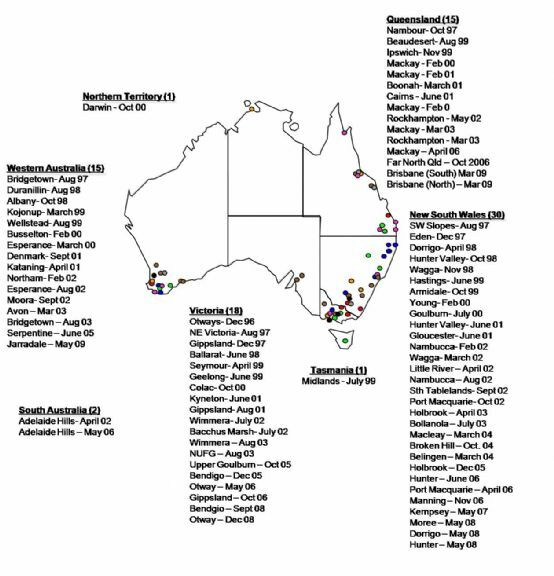 SInce 1996, 82 regional MTG courses have now been conducted around Australia involving more than 1750 participants and 30 partnering organisations. We have also provided many refresher courses for past MTG participants, conducted regional workshops with stakeholder groups, contributed to numerous field days and seminars, presented at local, national and international conferences, published popular and peer reviewed books, chapters and research papers, and contributed to a number of television and radio presentations. Some of the 200 or so Western Australian Master TreeGrowers inspecting a Sandalwood plantation. 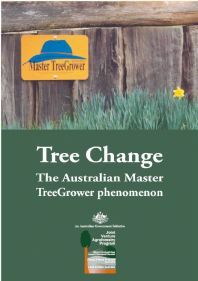 Today, the Australian Master TreeGrower Program (MTG) is a comprehensive extension package involving many national, state and regional organisations and hundreds of individuals. Yet, the MTG remains focused on ensuring that the development of forestry and native vegetation management on farms is driven by the aspirations and opportunities of Australian farmers and underpinned by the best available scientific, market and practical knowledge. The program does not promote particular species, products or management options. The MTG simply encourages farmers to truly aspire to be 'master tree growers' in their own right and provides some of the skills, support networks and confidence to launch them on that lifetime journey. The Australian Master TreeGrower is an 8-day, field based, course for landholders interested in planting and managing trees for conservation and profit. The course was designed up by Rowan Reid in 1996 when he was an academic at The University of Melbourne. Since then there have been 85 courses involving more than 1800 landholders across Australia. Participants receive Master TreeGrower hat, gate sign, MTG Diameter Tape, books, certificate, MTG Lapel Pin & more. Improving the design and management of agroforestry and native vegetation projects on participants' own properties. 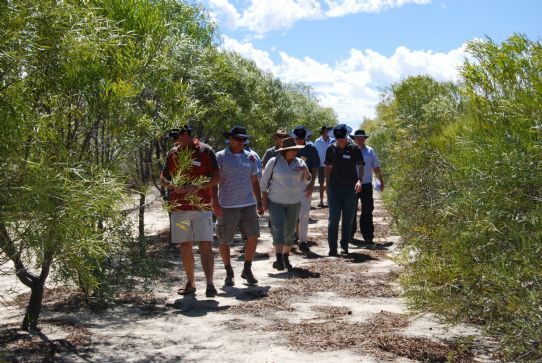 Helping participants understand the interests of governments, catchment authorities, industry groups and community organisations in agroforestry and native vegetation management and encourage mutually beneficial partnerships. Facilitating the involvement of participants in the development and promotion of agroforestry and native vegetation management within their region by providing a wide range of knowledge, skills, experiences and networking opportunities. Each regional MTG course is presented as a partnership between the MTG Inc., the participants and one or a number of regional partner groups or organisations. The regional partners maybe landowner groups or networks, government agencies, catchment management authorities, non-government organisations (such as Greening Australia, Landcare groups and Australian Forest Grower branches) or industry bodies. Whilst every program is different, reflecting the different issues and opportunities in each region, there is a commonality in purpose and style. To ensure consistency and uniformity across Australia, while at the same time allowing individual regions adapt the content to suit their particular situations the MTG program has developed a framework for regional courses to follow. How regions 'fill-in' the basic framework is flexible and depends on regional land management constraints, the interests of regional partners and the requirements and interests of the participants. Although the basic framework sets out 8 one-day sessions totalling around 50 hours, regions may wish to adapt this structure to suit their own circumstances (such as a mix of evening seminars and afternoon field trips). In order to allow for participatory learning and reflection the program should be delivered over a period of at least a month, preferably two. This also allows time for adapting the course content and for participants to build relationships within the group. The framework, as outlined below, provides a guide to regional program coordinators and partner organisations. It includes a description of the preferred content of an 8-day course and the order of delivery. The framework also identifies where Rowan Reid is involved in the presentations. The actual program for each course is adapted in negotiation with the national MTG coordinator and may look quiet different. Purpose:Raise the profile of the MTG program amongst regional partners, sponsors, industry and landholders within the region and identify potential co-investors and participants. Introduce the concept of multi-purpose forest design and management and identify participant aspirations, interests and information needs. Regional MTG coordinator introduces themselves, the local sponsors and the University of Melbourne presenter (Rowan Reid). Rowan then presents an introduction to multipurpose farm tree design and management using case studies including one of his own experience and others of leading proponents. 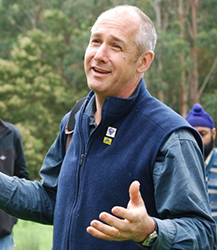 Following morning tea Rowan then invites participants, partners and regional stakeholders to share their interests in trees and native vegetation management and thereby highlighting the diversity of motivations, interest, experience and perspectives amongst the group. Finally, he introduces the MTG program, identifies the sponsors and their interests, outlines the national support available to participants and regional groups then passes over to the regional partners who outline the possible course content, dates, venues, costs, transport options and safety on the course. During lunch participants are invited to sign up to the program and collect their MTG hat, books and folder of local notes, maps and contact information. An afternoon field trip to the properties of one or two key participants or past Master TreeGrowers in the region provides a basis for looking at local issues and opportunities and the application of agroforestry design. Landholders conduct the tour, with notes if possible, covering their motivations, experience and plans for the future. This provides other participants with a clear idea as to what is expected of them when they present their experience later in the program. Purpose:Introduce and review markets for wood products, non-wood products and environmental services; provide participants with skills in tree and forest measurement; and, provide theoretical and practical information on the biology and management of forests for the provision of products and services. This includes visits and presentations covering local, regional and national tree and forest products and services sought by industry, government or the community. The emphasis is on off-farm consumer and stakeholder needs, product and service specifications, demand and supply trends, pricing, and trading mechanisms. Topics could include timber, non-timber products, water, carbon credits, biodiversity values and community concerns and will reflect local opportunities and the interests of participants identified on Day 1. Presenters might include regional catchment management authorities, forest product processors, water authorities or others who are potential purchases of the products and services provided by farm trees and native vegetation. Rowan Reid is usually not present for the second session. If he is involved it is only as a participant and not as a presenter. Possible program for Session 2: Presentations by local industry, agencies and community organisations then tours of processing plants (sawmills, export facilities, water treatment plants, tourism enterprises, local craftsmen, bush food processes etc). The aim is to identify the market opportunities and trading methods for a range of possible off-farm products and services that arise from the establishment and management of trees and native vegetation on farms. Discussion and practical exercises in tree and forest measurement including the use of the Australian MTG diameter tape which is provided to each participant. Methods and techniques will reflect product and service options: Wood production, carbon accounting, biodiversity values, recharge control etc. In all states other than Western Australia Rowan Reid is involved in the presentation of this session. Possible program for Session 3: Rowan presents an introduction to tree and forest measurement and distributes the MTG tape to participants - emphasis is on measuring standing biomass and competition in forest stands in relation to wood production, carbon sequestration and other product options. Other presenters may be asked to cover specific product (such as bushfoods, fodder, essential oils etc) or environmental service measurement (such as monitoring biodiversity, water quality or recharge control). Where there are regional differences in the techniques used to measure forest values (such as biodiversity) these will be covered by local presenters. During the day participants will undertake a field based exercise in tree and forest measurement which will include the establishment of a sample plot and the use of the MTG tape to measure height, diameter and basal area. Following the exercise the group usually returns inside for a review of data and presentation on the principles of forest growth and management delivered by Rowan and others. This session usually involves presentations and field trips covering tree and forest growth and management options appropriate for the products and services being considered locally. Actual topics will vary greatly from region to region and may include: vegetation classification and identification, planning and legislative requirements, establishment and regeneration options, spacing and competition management, species mixtures, silvicultural treatments (thinning, pruning etc), use of fire, harvesting methods (varying with interests and vegetation types). In many areas the program tackles native forest management as well as revegetation. Presenters for this day are usually regional professionals and experienced practitioners who are able to use locally available sites or participants' properties to illustrate relevant forest management options. Purpose:Review regional opportunities and approaches to integrating trees and native vegetation management into farming landscapes for both conservation and profit. Content:During these three sessions, field tours should involve inspections of participants' own properties and key regional examples with invited specialists who are able to facilitate, contribute and encourage discussion on 'themes' (such as salinity, marketing, biodiversity, taxation, farm planning, shade and shelter etc) that are relevant to the participants' interests or reginal opportunities. A mix of lectures, workshops and field tours with 2 or 3 experts participating for the whole day seems to work best. As many of the participants as possible should be given the opportunity to conduct a short tour or presentation of their own properties or experiences. Purpose:Review the motivations and interests of participants and discuss the evaluation of agroforestry opportunities. Finish by engaging participants (with regional catchment planners and other stakeholders) in a review of the research and development needs for agroforestry in the region and the prospect for development of sustained regional information networks that involve landholders and interest groups. Content:Rowan usually attends this session and presents on the economic aspects of tree growing. If required he may also provide a presentation on the use of trees for shade and shelter on farms. With a facilitator, the group then discusses the regional agroforestry and native vegetation management opportunities and needs. A short period of reflection on the course content and value is useful before closing. Rowan will also ask participants to complete an 'end of program' survey. Finish with a celebration dinner or lunch (maybe with a guest speaker) and the presentation of the MTG certificates and gate signs (by Rowan and the coordinator) to graduates. The MTG program seeks to encourage and support viable regional landholder groups that can provide ongoing support and a active information network for participants. Where this has been possible the MTG participants play a key role in maintain the networks. However, in areas where there is no landholder group or the agroforestry, landcare or farm forestry networks are poorly run or weak participants often feel that they are unsupported. At the invitation of regional groups, or even individual Master TreeGrowers, Rowan Reid has participated in many local events including field days, seminars and dinners. He has also run workshops and refreshers days on tree measurement, silviculture and shiitake mushroom production. These events are important in supporting past participants, maintaining and extending their information networks and introducing the program to more people. There are now many regions around Australia where the 8-day MTG course has been repeated on a regular basis in partnership with strong community based landholder networks. These include the Hunter Valley (Hunter Farm Forestry Network), New South Wales north coast (Mid North Coast Farm Foresters), the Otway Agroforestry Network, the Gippsland Agroforestry Network, North Central Victoria (Northern United Forestry Group), the south west of Western Australia (Trees SW), the Western Australian wheatbelt (AVONgro), and tropical Queensland (AFG branches). Not surprisingly these areas represent the most active and well supported farm forestry and native forestry management areas and areas where there is ongoing relationships between practitioners, extension agents, researchers and policy makers. Based on the success of the Otway Agroforestry Network's Peer Group Mentoring Program the MTG has taking the concept national with two new pilot projects in Western Australia. The PGM formalises the role of landholders and regional groups in the delivery of extension, development of regional policy and programs and the two-way flow of information with researcher, many of whom have been presenters in local MTG courses. The PGM concept is discussed in detail in Chapter 4.